Allow me to introduce you to the one of the best game in the casino that you know nothing about: Baccarat. Like many of you, for a long time my only knowledge of baccarat came from watching old James Bond films where he always seemed to be playing in Monte Carlo (no matter the actual setting of the film) and where the dealers said things like huit and neuf, which I think is French for "douche" and "dickhead", respectively. * There are two really good reasons to play baccarat: it requires no real skill, and it has a very low house advantage. Baccarat is not popular with American gamblers, and I think there are three reasons why. One, we love our slot machines and roulette – anything that has bright lights, shiny balls, and makes lots of god-awful noise that keeps us from having to actually think and exercise a skill when gambling. Funny thing is, casinos also LOVE slot machines and roulette because the house has a large mathematical advantage on both (in other words, the payouts are not calculated using true odds of winning, and thus even when you win, the house wins a little bit as well). Savvy gamblers know this axiom: if the casino likes something, you need to hate it. As a corollary, and as I explained to my children when they were younger, never play a game with a wheel or a ball. The casino will kill you with a wheel or a ball. Dice are fine if the game is Craps (just don’t play Michael Jordan), but no games with wheels or balls. This includes the wheels in a slot machine, in case you are wondering. Repeat after me "We do not play games with large house advantages." That is for the rubes – let them play their slot machines and roulette and help build bigger and better casinos, we are going to gamble smart. We will still most likely lose, but we will do it smartly and smugly, looking own our noses at the roulette table and slot players. B. The casinos do not like baccarat for the opposite reason of the axiom cited above. All players should love baccarat, because it has a very low mathematical house advantage, and because of that, baccarat tables are few, and are usually hidden away from the main thoroughfares of the casino. You have to look for them. Sometime they will be hidden in the "high rollers" room to scare people away even more. III, the game looks intimidating. The rules of when additional cards must be dealt are complicated. There are usually serious looking people sitting at the table, and they do not look like they are having any fun. 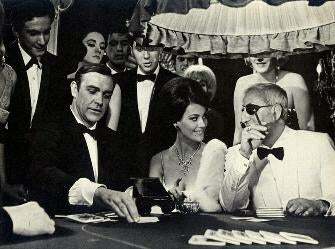 Plus, most Americans' only exposure to baccarat comes from James Bond movies from the 1960's, where the dealers spoke in French. Ignore all of that. Casinos bank on that, and want you to be afraid. Do not be. At its heart, baccarat is as simple as playing black or red on roulette, but without the annoying house advantage. There are a couple of different forms of baccarat that are spread at casinos in the U.S. Big Table Baccarat is the most intimidating, and requires the most player interaction because you may actually find yourself dealing cards. It is what 007 played. You are not bankrolling the game or anything, and the dealer will tell you what to do, so it isn’t any big deal, but it is intimidating to be the one that has to deal cards. But if you find yourself at a Big Table, relax, you are allowed to pass the deal. The rest of the game is the same as described below. The Big Table Baccarat is usually limited to the high roller rooms, with table minimums of $100 on up. Mini-Baccarat is what you will normally find on the casino floor, and looks more like a blackjack table, with the dealer dealing cards and handling other traditional dealer duties. I recommend starting out at Mini-Baccarat for no other reason than it is less intimidating, and the table limits are usually smaller, around $15 or $25 per hand. Plus, you can sit there and barely pay attention and no one is going to expect you to take the shoe and deal. I said that casinos do not like baccarat, so you might be asking why they have it at all? The answer is simple - Asian gamblers. That's it. Every casino that wants to attract Asian "whales" – people that will wager insane amounts on each hand – has to have baccarat because it is the blackjack of Asian casinos – the most popular game in that part of the world. As it was explained to me by a pit boss (so it may be true, it may be racial stereotyping, or both) a lot of serious baccarat players are very superstitious and believe that fate plays a role in baccarat. They believe there is a skill to seeing patterns in the prior results, and therefore skill to predicting who the next hand will favor. Not card counting, mind you, because card counting is basically irrelevant in baccarat, but an actual determination of who fate is favoring. They will keep detailed notes of each hand – whether the "bank" hand or the "player" hand won, whether a card was taken, if the winning hand was a "natural", and most importantly, any streaks or patterns in the results. Sometimes the casino will have an electronic hand history board on the table which shows this same information. The best part about these meticulous notes, and the electronic scoreboard, is that it is a complete waste of time. But it's fun to watch these guys get all worked up when fate spits in their face. Now, on to the good stuff. And I should point out here that all percentages and odds are as calculated by www.wizardofodds.com. I am no mathematician, but the Wizard is, and he is fantastic. I highly recommend that if you gamble, or are thinking of gambling, review his site. It has almost every game and the mathematical breakdown of why Las Vegas can build such enormous hotels and casinos on the wallets of people looking to win big. There are only three bets to make on a baccarat table, and thus for the player the game is as simple as placing your wager in a circle. There is a circle called "Banker", a circle called "Player", and a circle called "Tie". First rule – ignore the circle called "Tie". It is a sucker bet, with a whopping 14.36% house advantage. Sometimes there is a "Pair Bet" circle. Ignore that as well, it has a 10.3% house advantage. I am going to give you credit for being smart enough to deduce that this leaves only two places on the table to place your wager: the "Banker" and the "Player" circles. The dealer will deal two hands consisting of two cards each. One will be the "banker" hand, and one will be the "player" hand. But "banker" and "player" are misleading because these hands do not represent the dealer and the player. What you are actually gambling on is which hand (the "Banker" or the "Player") will ultimately be closer to 9. You are allowed to bet on either one, and you do not have control of either. So the next rule is to ignore the "Banker" and "Player" labels. So let's just call these two bets "B" and "P". I will give you credit for being able to figure out which is which. If you can’t, well you likely couldn't find the baccarat table anyway so it is immaterial. The basic object of the game is to bet on the hand that will ultimately be closest to or equal to 9. If you bet on the correct hand, the casino pays even money on your bet (a commission is paid on B bets, I will explain below). That is all the strategy involved – pick the hand that will win. No card counting, no adding numbers in your head, and no special rules for hard/soft. For gamblers that want to play a game with a very low house advantage but is easy to play, this is the best game in the whole casino to play. The rules are actually somewhat complex, but you don’t need to know them – that is the dealer's job. In fact, you do not need to know any of the rules to play the game. You just need to be able to distinguish a circle on the table, and whether that circle says "Banker," "Player" or "Tie." A first grader could play this game. You could literally play this game and read a book, paying no attention to the cards at all, and it would not change your outcome one iota. If you want to know what the dealer does and when they do it, read on in this paragraph. If you just want the strategy (which is exceedingly simple), move to the next paragraph. Once bets are placed, the dealer will deal two hands face-up consisting of two cards each – one representing the B and one representing the P. The dealer will add the value of each hand using the value of the cards. If the sum of the cards in a hand is greater than 10, only the single right-hand digit is used (ex. 7 and 9 is a hand value of 6, not 16). Aces count as 1, tens and face cards count as 0. Because of this, no hand will ever "bust" like in blackjack. If either hand equals 8 or 9 when dealt, that is a "natural" and no more cards are dealt to either hand. A natural 9 beats a natural 8 (neuf and huit, respectively, by the way. James Bond always had neuf). Where it gets complicated is when additional cards must be dealt. If the P hand is 5 or less, the P hand will receive one additional card (one card only, always). The sum of the three cards will be the total of the hand (ex. a hand of 2 and 3 will be 5 and will take a card. If a 4 is dealt, the new hand total is a 9, and cannot lose. If an 8 is dealt, the value "wraps" back around and is a 3. If a King is dealt, the hand remains a 5). Based on the new total of the P hand, the B hand may or may not be required to take a card according to the rules, which are set forth on "the tableau". The best part is, again, you do not have to know any of this or make any of these decisions – it is all set pursuant to a set of rules, and there is no discretion on the part of the dealer. Because of that, baccarat is statistically a very stable game, with no "outside" influence, like you might experience in blackjack when other players at your table splits Kings or hits on 16 against a dealer 6. As for the statistics, this is why this should be your favorite game in the casino. The house edge is a measly 1.06% on the B bet, and only 1.24% on the P bet. Both of these are fantastic from a gambler's perspective, and make baccarat one of the best bets in the casino. Plus, there is no strategy other than to simply always bet the B bet – that is put your wager in the circle marked "Banker". That's it. You don’t have to do anything else. The B bet has a statistical advantage over the P bet based upon the rules of when additional cards must be dealt, small, but an advantage nonetheless. Because the "B" bet has a statistical advantage, if you win a bet on "B" you must pay a commission of 5% to the house (which makes the actual payoff 19 to 20), but the house edge calculation takes this commission into account and it is still a better bet. You can run a tab for the commission and settle up anytime, but you must settle up before you leave the table. And that's it. Like I said, as simple as playing black or red in roulette, but a much better house advantage. ** You could count cards if you want to, but the advantage would be so infinitesimal as to render it pointless, and it really doesn’t help you chose between B and P anyway. You could follow along with the serious Asian gentlemen dutifully charting every hand and the streaks or patterns, if you were so inclined, but this is a complete waste of time as each hand is an independent event. It is a great game to play after drinking bourbon and betting on sports all day because you don’t have to add, or even see straight, as long as you can put your wager the circle. Trust me, I have tested this and it runs true. Plus, it moves slower for some reason, and the dealers are usually pretty cool. I think they like people that bring some life to the table. So grab your boys and descend upon a baccarat table and have some fun losing your money smartly and mocking fate. Oh, and don’t forget to make snide comments about the rubes. If you enjoy this column, let me know and I will do other columns about other casino games in the future. I could write a book about Craps. *This could also be because they were actually playing Chemin de Fer, a variant of baccarat. ** Black/red in roulette is not a 50/50 proposition, as a lot of people seem to think. It pays even money like it is 50/50, but the existence of a 0 and 00 on the wheel make the house advantage up to 5.26% for 00 wheels. On single 0 wheels it is 2.7%, so for the love of god, if you have to play roulette, at least play on a single 0 wheel! By the way, this house advantage is even across every bet in roulette, no matter what you play.